Often associated with the Bamburgh Castle, Bamburgh Beach is a site in its own right. This beach that is more of a sand dune than a laid-back shore is home to more adventurous tourists looking for a lot of fun both on water and on land. Bamburgh Beach is located in Bamburgh, a small village on the coast of Northumberland. It’s right in front of the Bamburgh Castle and southwest of the Farne Islands. The best feature of the Bamburgh Beach is its sand dunes. The drops in the sand make for different activities that make visitors shout in delight. The sea also offers great waves that make it a favorite among surfers. But even if you visited Bamburgh Beach to relax, you are greeted with views of the Bamburgh castle which is such a beauty, especially when hit by sunset. You can also catch a glimpse of the Farne Islands from the shore when the tide is low. The Bamburgh Beach enjoys a Blue Flag status which is one of the highest distinctions given to beaches all around the world. A blue flag on a beach implies that it is well-maintained and conforms to the highest standards of environmental care. There are also public toilets along the beach and enough space for visitors to rest and walk around. Because there are only a few tourists on the shore, you are often free to walk, sunbathe, and have pets around. You can even go horse riding along the shore. Unlike other beaches where everyone else is putting on tanning lotions, in Bamburgh Beach, the favorite pastime is surfing. The beach is a great location for surfers everywhere because of the waves that never let you catch a break. It’s astounding how the waves that used to scare the Mariners became one of the favorite waves that surfers enjoy. You can also try dune sledding thanks to the up and downs of the dunes. You will definitely have a different ride of your life in these drops. Mentioned a while ago is the Bamburgh Castle and the Farne Islands. 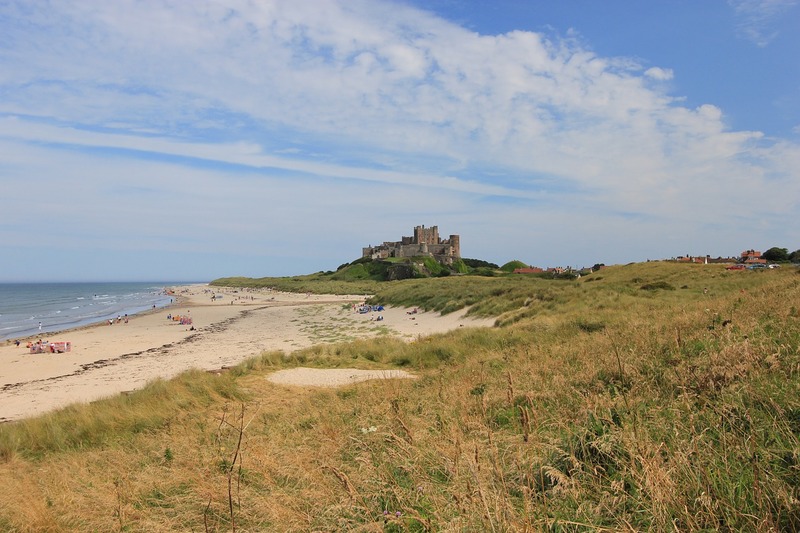 These two are the nearest tourist destinations for anyone visiting Bamburgh Beach. Bamburgh Castle is always a must-see in Bamburgh simply because it has a rich history. The castle is known to be the place where the former Kings of Northumbria resided. It is also said that the castle you see now is just a completion of William Armstrong’s work because the original one was destroyed by the Vikings in 993. Only the Normans started rebuilding it and the core of the castle is the only part that remained of that era. On the other side of Bamburgh Beach is the Farne Islands. This group of islands usually has fifteen to twenty islands depending on the tide. This place is famous among bird watchers and scuba divers because the islands offer great scenes for seals and wrecks. The islands can also accommodate divers from beginner to professional.